If you are craving for a simple yet tasty Paneer recipe that won't take hours of preparation, and which you can savor with Rotis/Parathas/Naans or Rice, look no further. Kadhai Paneer is a healthy, nutritious, protein-rich and almost fat-free Indian curry that will leave you satisfied at the end of your meal. Flavored with kasuri-methi, ginger-garlic and a blend of mild Indian spices, it can be ready in a jiffy and can be a perfect accompaniment to bread or rice for a fulfilling weeknight dinner! Sending this over to Srivalli for Monthly Mingle, featuring Kid's Lunches this month! Heat ghee in a pan, add the chopped onions and the chopped bell-peppers and saute until light brown and soft, but not mushy. Add the ginger-garlic paste and all the masala powders, except kasuri methi, and roast for 2 mins. Then add the tomato puree, salt, sugar, kasuri methi and the paneer cubes and let it cook, partially uncovered, for about 8-10 mins on medium heat. Check for taste and adjust seasoning if needed. Garnish with freshly chopped coriander and serve hot with Parathas or Vegetable Pulao. can I have some please. Dinner is not ready yet. :) looks delicious ! 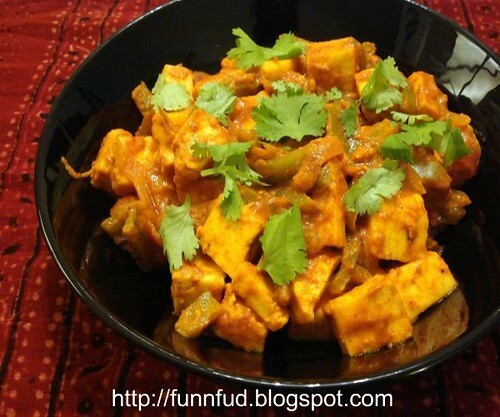 mm..delicious looking, i have always loved kadhai paneer! Mouth watering dish.. looks delicious. Love Kadai Paneer....Kadai Paneer is very tempting.. I love kadai paneer.I like your version too. Kadai Paneer with kasuri methi sounds yumm. Lovely click! thanks guys! not much to go wrong wit this recipe, ut yes, the kasuri methi does add a lovely flavor, and so do fresh tomatoes:) glad you'll liked it! Looks delicious. I don't think I have tried Kadrai paneed in my life. would love to have these with rotis...it looks yummm nice snap. well written recipe. I always seem to have some paneer in the freezer.Great recipe to try. I've been cooking with paneer a lot lately, but I never can get my fix. I want some of this right now. Lovely! Great recipes. I'm bookmarking your site right now. I feel hungry again, and I've only just had lunch! I tried it yesterday..... It was delicious. Please grab your award from my blog. bell pepper and paneer! such awesome combo no? Thanks for the Kadhai Paneer recipe. Last summer I ate them at a party and has been looking for an authentic recipe ever since. Now I will be able to make them myself. Thanks again.